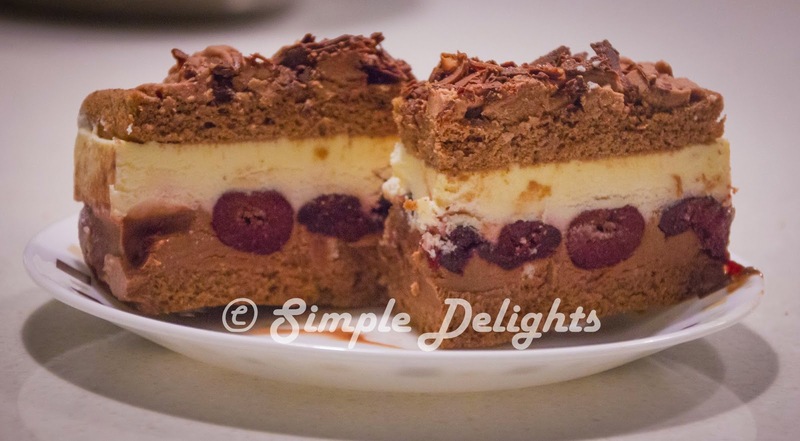 A completely different Black Forest Cake. I came pass this cake recipe years ago. I do bookmark as a cake I must do when I have an opportunity. April month was full of celebration. One of the special day was my beloved birthday. I did not bake him any cake last year, during my pregnancy I was so put off by any sweet . So I can not make any baking. This year I promise him I will do a special cake for him. So what does he expect from the cake ? He love chocolate and want something creamy. So this is the right cake!! So this recipe that I have bookmark from my favourite blogger ->DailyDelicious Black Forest Cake . is the best choice for this event. 1. Mixed egg yolks and 25g caster sugar with hand whisk till is combine . 3. Sift the cake flour mixture into the egg yolks mixture and combine till no lump. 4. Preheat oven till 160C. 5. Used electric mixer beat the egg white till foamy and gradually add in the sugar. Beat the egg white till peak foam . 6. Fold 1/3 of the egg white into the flour mixture combine well and continue to fold the egg white in 2 batches into the flour mixture , till all combine well. 7. Pour into the rectangle mold and bake for 15mins or baked. When the sponge cake was cold , cut into 2 pieces of square cake that fit into 6" loose base square mold. -> I actually used the juice from the can of pitted cherry. -> Melt chocolate , and put the 35ml whipping cream into it and mixed. Pour the mixture into the remaining cream and beat till soft peak. Chilled in fridge . 1. Beat the yolks and sugar till well combine. Boil milk and pour the hot milk over the yolk mixture and whisk all the time. 3. P;ace a sieve over the chopped chocolate. When the egg mixture is ready, have the mixture slowly pour onto the chopped chocolate through the sieve. 4. Wait for 1 min and stir till the chocolate is all melted and let it cool to room temperature. 5. Beat the whipping cream till soft peack, spoon 1/3 of the whipped cream into the chocolate mixture , fold to combine and pour the chocolate mixture back into the whipped cream and fold to combine. Put 1 piece of the chocolate sponge cake in the 6" square mold sprinkle with syrup . Pour the chocolate cream over the sponge and refrigerated for 2 hours until firm. 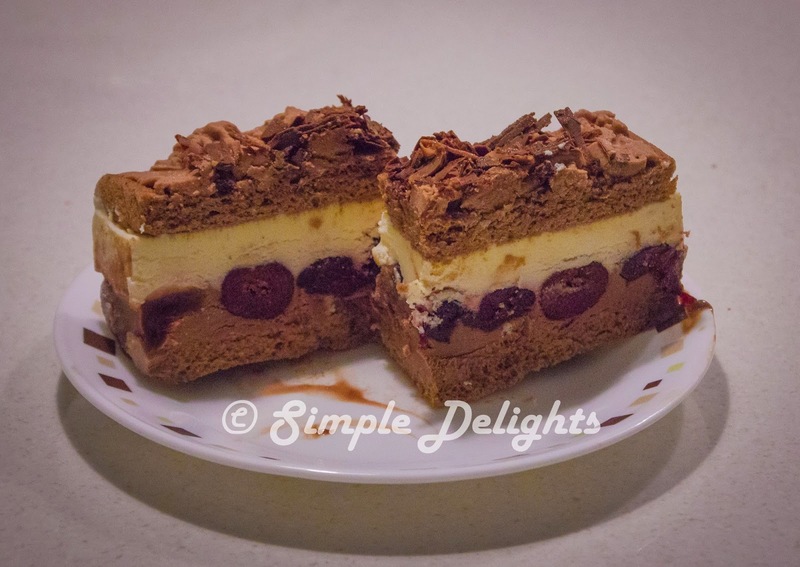 Drained the cheery and place the cherries over the chocolate cream. Make Kirsch flavor whipping cream. 2. When the cream is cold mix in the kirsch ( brandy) and the rest of the cream whip till soft peak. Spread the cream over the cherries sponge and place the other pieces of chocolate sponge cake on top. Sprinkle with syrup and refrigerate until firm . I did overnight. Before serving , decorate the cake with chocolate whipped cream , chocolate shave and cocoa powder. As I did not drained the cherries enough , my chocolate cream part was really melting when I unmold my cake. I have to freeze the cake to have it come out nice. If I make this again , will put some gelatin in the cake or use fresh cherries I think would be better. My husband love this cake to the bits . I promise nobody will share his cake , so basically he has this whole cake himself. I knew he enjoy it lots.